At Crunchify we are using Genesis Framework since last 5 years. Without a doubt it’s one of the most popular WordPress Theme Framework out there. As you may have noticed recently, last week we have upgraded theme at Crunchify.com and wanted to have nice 728x90 ads in middle of posts on home page. How can I insert ads on the homepage? 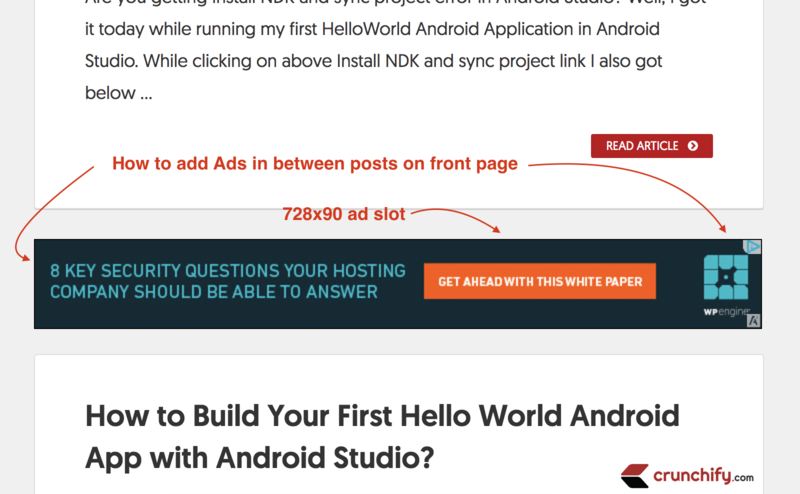 How to insert Ads between posts in your WordPress homepage site? Where to paste the ad code in your HTML? On Crunchify, we have decided to show top 9 posts on home page. 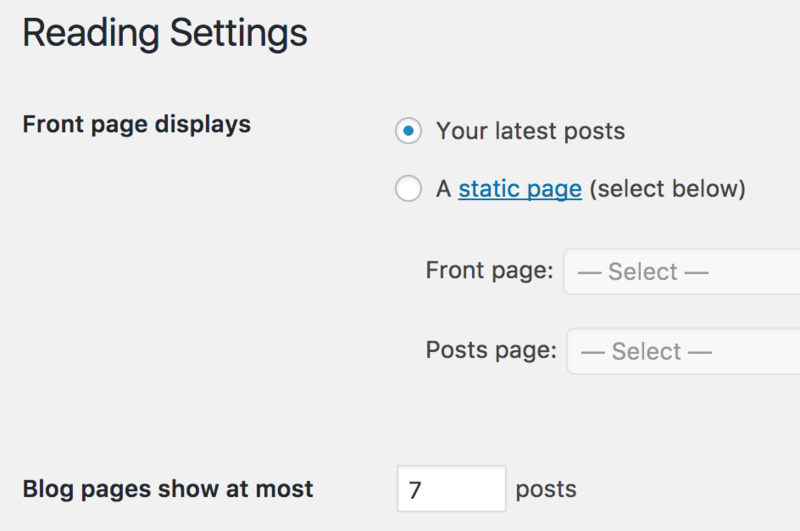 If you want to make any changes on how many posts you want to show then go to Settings -> Reading Panel and make changes. As we have total 9 posts on home page, we want to have 728x90 ad appears after 2nd and 5th post. In order to achieve that just add below code to your theme’s functions.php file. As you see in above code we have Grid layout on Crunchify hence we have different requirement to show ads after 1st and 4th post. Code is pretty simple. It will add ads after specific loop counter. Just change loop_counter value as per your need. Please change your adsense ID and replace with your ad code. You could see it live on Crunchify home page. Let me know if you face any issue implementing this. i apply those function to newspaper theme but it’s not working. can anyone help me. Hi Heng – could you share your theme page URL? This tip is dedicated for Genesis theme? I’m unaware of any newspaper genesis theme. Hello! Thanks for this tutorial, I am using CSS grid for my posts, how can I add a custom widget for every X post? I want to insert adds between my posts in grid style. Thanks! I would suggest to add ads after Grid Row and not after each post. If you have 2 columns layout same as crunchify.com homepage then try adding ads after 2,4,6 posts in loop. Just change number in above code block and play with it. Can you please tell me how to add ads after title like done on this page. Hi there – it’s a custom setup on site. Let me know if you any tutorial on that. Hi there – here is a short code which will help you add code after post title. NOTE: This code won’t work as it is. It’s part of add_filter( 'the_content', 'crunchify_social_sharing_buttons'); filter. i’ll try to create complete tutorial on this within few days. How to embed comment box, like which you have on crunchify? Hi Prashant. Sorry for late reply but can you please share some more light and send screenshot about your requirement? Dear Sir, Can You Please Provide After Post Subscriber Code. I am very heart and search but not find any good looking code. Hi there – just to understand better, do you mean the same subscription code which I have it on Crunchify here? Great post, but what about inserting different widget or shortcode content in the after post via a defined offset? For example, show widget container 1 after post 2, show widget container 2 after post 4, etc.? Hi Drew. It should be fairly simple. Basically, instead of calling Adsense code or any other ad code, you could just call PHP function with represents a specific widget or Shortcode. Are you looking for a sample code for it?